What kind of heart did dinosaurs have? Fossil evidence of the soft internal parts of dinosaurs, including the heart, is sadly lacking. But based on indirect evidence—and one heart from a dinosaur called “Willo”—paleontologists have extrapolated that dinosaurs had a divided heart capable of keeping the blood at two different pressures. Dinosaur bone tissue also shows evidence of blood vessels. Therefore, a heart was necessary to drive the circulatory system, sending blood around the body. Dinosaurs with extremely long necks (such as the large sauropods) and those with heads held upright needed a high blood pressure. This would allow the blood to pump all the way to the brain when the animal was reaching for food. But such a blood system would have too high a pressure to safely circulate to the lungs for oxygenation. Thus, scientists believe dinosaurs probably had a divided heart capable of supplying blood at two different pressures into two separate circulatory systems. 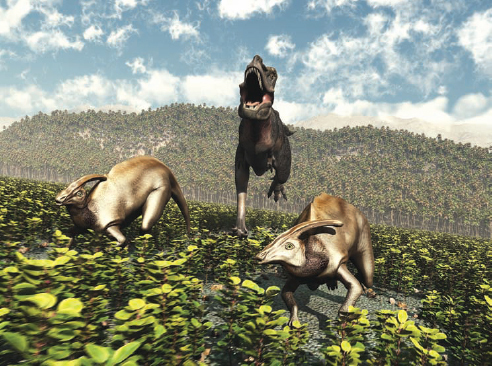 Hunting theropods like this Tarbosaurus required larger brains and more active metabolisms in order to catch their prey (Big Stock Photo).